Recording stops when viewing live - Make a Wish - Alfred Center | get the most out of the best home security app! After receiving notification I opened Alfred to watch live. Recording stopped so I don’t have a video of the event. Can this be changed? For the moment, Alfred’s Motion Detection doesn’t work during live-viewing sessions. You can, however, manually record clips if you see anything worth capturing tho! If motion is detected, and the recording is automatic, why would you want to stop the recording just for it to be started again? This is backwards, and is not obvious enough to the user. Alfred needs to clearly communicate that motion recording will be stopped once the notification to watch live is selected. This also goes against standard surveillance system functionality that has been used for decades. If motion recording is ON, then that’s it, it should stay on and record the scene until there is no longer motion. Why would anyone want a robbery to be recorded only for a tiny bit? Thanks for sharing your thoughts with us. We are actually looking to the possibility of developing Motion Detection during Live. Due to technical limitation, this feature is currently unavailable. However, we will definitely deliver your idea with our team. Please continue to support Alfred and stay tuned. A quick work around to this would be to have 2 cameras setup anyways, not only for redundancy if one camera fails for some reason. But also allows you to view with 1 camera whilst the other camera is still recording motion. Not sure how setting up two devices to perform one function then wait for an eternity for Alfred to supply the functions that you require is the quick fix ? Why not sell your camera device and buy a standalone IP camera that can perform the functions you require like motion detection record and live view at the same time, oh and proper ir night vision Pan tilt function email notifications and many other built-in functions that just work. Once you have to start adding lights and sensors and even maybe extra phones the adage of utilize your old phone becomes a nonsense and starts looking like a makeshift mess. Install Alfred and use the App great but as soon as you have to start spending more cash to get it to work to your satisfaction then you are entering the money pit because it can’t be and never will be a security camera. 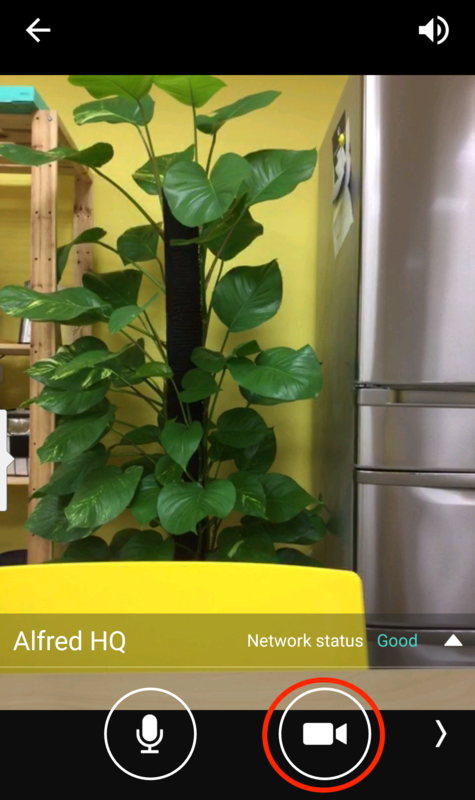 The ultimate use for Alfred is as a discrete camera in your premises, just leave it on the sideboard charging and wait to see who has velcro fingers. @Jacob I like Alfred and have been using him successful for some time but I use him in conjunction with other systems. I expect someone else might have something to say about this. For someone complaining about setting up 2 cameras, I believe that is the setup you have at your front door as posted in previous threads, Alfred, and another DVR IP/IR Cam system. 1 requires alot more than just two phones. Why you need Alfred if your other real IP Cam system is the cat’s meow? I got multiple old phone cameras, and other setups as you do. Alfred still comes out on top, when a little lighting here and there, proper location, and proper settings, Alfred puts a big box systems to shame when compared to the QUANTITY Alfred, NOT its QUALITY. Its a Playstore/IOS app, not a $500 - $1500 Lorex system. Alfred’s not being pumped of in a factory by the thousands a day. We would all like to drive an expensive maintenance FREE car, but we drive what we can afford. Alfred is my FREE chauffeur, no Huff, no Guff. And the post was not regarding you or your opinion of the disadvantages of Alfred or how adding a second Camera, and ambient light is non sense to YOU. Its a moot point, and doesn’t answer his question on how to; “VIEW AND RECORD SAME TIME”. AGAIN, if you have some kind of RELEVANT information like; The ultimate use for Alfred is as a discrete camera in your premises, just leave it on the sideboard charging and wait to see who has velcro fingers…" By all means comment on my posts, otherwise get a clue. ALFRED is not a Professional Security System and shouldn’t be compared as such, it’s apples and oranges. If you want a guaranteed product buy a real system. Stop picking on Alfred. Not to mention Alfred is in its infantile stage of development. Outstanding it’s like fishing in a gold fish bowl. When ‘live viewing’ an event occurred and was not recorded as Motion Detect did not work then. Imagine seeing someone about to smash the phone and before you can record or activate the alarm, phone is gone.